[0:02] <blockh34d> very doable tasks every one. [0:04] <Raynerd> in your latest code, the text name doesn`t change?! [0:06] <Raynerd> right, I`m going to have to go bed... my head is hurting!! [0:10] <blockh34d> you know what a code block is? [0:10] <Raynerd> Ooops I see!!! [0:11] <blockh34d> i had screwed up and put that 'change up the player text' stuff in the 'player pressed enter' code block, which works for if they press enter then, but not otherwise (oops). so the fix here is get it out of that inner block and up into the parent block. [0:12] <blockh34d> you'll get it all sorted no problem i'm sure. python is super easy and you seem like a smart guy. good luck! [0:12] <Raynerd> thanks for all the help! [0:15] <Raynerd> yes, I`ve used functions in C but never in python. Will have to read! [0:18] <Raynerd> I can`t understand at all how you have added the rectangle where the text sits! [0:19] <blockh34d> should me and Raynerd be having this chat in a msg window or main chan window? [0:19] <blockh34d> we couldnt figure it out, seems good either way, maybe this helps other people etc. but if its too much lemme know. [0:20] <Raynerd> I`m gonna have to sleep soon! [0:20] <Raynerd> think I`ll have to! [1:12] <GeekDude> mjpeg-streamer is giving me ~2s delay. Any way to meaningfully troubleshoot this? [1:13] <blockh34d> you're streaming a picam? [1:13] <Colsarcol> Can you run live video of the RPi cameras? [1:14] <GeekDude> Anyone here with a mindstorms NXT? [1:17] <blockh34d> how about both Colsarcol ? [1:18] <GeekDude> Both sounds fun. Isn't there an pi-arduino crossover board? [1:23] <blockh34d> does it do 1080p at 30fps? [1:24] <Colsarcol> blockh34d, what have you dont? [1:25] <Colsarcol> Used arduino for that? [1:27] <Colsarcol> :O 3d printer! [1:28] <blockh34d> pruse i3 6" or 8"
[1:34] <Colsarcol> Oh god did you see the video on amazons packing houses? [1:35] <GeekDude> Did you see the homebrew gps based beer-delivery drone? [1:42] <T3CHKOMMIE> ive got a moment button, that seems to have a mind of its own, and im not sure, by reading the code, what the pin should be expecting and if I need a pull up resistor or somethign else. [1:47] <blockh34d> shortie is there a link for that? [1:49] <T3CHKOMMIE> ya, i like the idea, but not the expereince of chromium. [1:50] <ShorTie> you using C or python ?? [1:51] <blockh34d> sudo apt-get install luakit? [1:51] <T3CHKOMMIE> ShorTie, python, the code on gitup, its just hard for me to read. not how I would have written it. [1:54] <blockh34d> totally obscure ui, yah! [1:55] <blockh34d> well luakit looks graphical here, maybe textmode is an option? [2:01] <blockh34d> in what, wiring? [2:02] <T3CHKOMMIE> That is the python script that is ulitmately doing the ticks and button press. [2:05] <blockh34d> why not use another switch? [2:07] <blockh34d> have you tried adjusting BUTTONSHORTPRESSTICKS and BUTTONLONGPRESSTICKS? [2:07] <T3CHKOMMIE> i started making the tick counter longer. [2:07] <T3CHKOMMIE> looks like its WAY more stable now. [2:10] <T3CHKOMMIE> btw gordondrogon's stuff is awesome. [2:10] <T3CHKOMMIE> its really sweet, I have it mounted on my motorcycle. it generates an overlay with gps temp and speed, and i also wrote a google earth KML generator so you can see the tacking on it. [2:11] <T3CHKOMMIE> once the oculus rift comes out in HD im going to go wild with it. [2:12] <T3CHKOMMIE> there was a sweet project by MITRE for low latency 360 video for tank drivers, it looks JUST like oculus. [2:13] <T3CHKOMMIE> ya that would be neat. [2:14] <T3CHKOMMIE> that is my first run on my way home from work. [2:15] <T3CHKOMMIE> ill keep an eye out. [2:17] <T3CHKOMMIE> ya "reality tv"
[2:19] <blockh34d> anyone any other ideas? [2:21] <blockh34d> PI IP Cam? [2:23] <T3CHKOMMIE> thanks for the help guys! [2:23] <blockh34d> sounds like a fun project, post test vids! [2:25] <T3CHKOMMIE> yeah and take a CRAP tone of resources. [2:25] <T3CHKOMMIE> ya i think i had it dropping frames in one of my vids, so i gotta look at resource allocation again. [2:26] <T3CHKOMMIE> later gents, thanks again! [2:41] <trohrt> How realistic is android on the raspberry pi? [2:50] <trohrt> Well with the new broadcom drivers, it seems more realistic, right? [8:50] <Chetic> Does the pi in any way support detecting power failure? is it possible to read vcc voltage? [8:51] <shiftplusone> Only with a multimeter. [8:51] <wallbroken> shiftplusone, which is the best class of SD to use with rPI? [8:53] <wallbroken> shiftplusone, SD or microSD? [8:53] <wallbroken> is the same? [8:55] <wallbroken> it's a samsung? [8:57] <sysx1000> Does FreeBSD ARM works with Raspberry Pi? [9:01] <wallbroken> shiftplusone, how long does it works? 2 years? [9:02] <shiftplusone> wallbroken, sd cards are not that predictable. I don't have that specific card, but all of the ones I bought when the pi came out 2 years ago still work. A few of the kingston ones are cracked around the corners, but still work. [9:03] <shiftplusone> but there are no shortage of reports of SD card which stop working either, and people who do a lot of development and re-flash the card many times per day end up with stacks of dead cards. [9:06] <shiftplusone> I am using a usb stick for everything (apart from /boot) on my main pi. [9:08] <shiftplusone> My benchmarks showed USB flash being faster than the SD across the board and I don't have a heavy network load, so it doesn't bother me too much. [9:21] <ShorTie> did i miss sumfin ?? [9:21] <shiftplusone> checked dmesg? you might see "some error, remounting read-only" sort of error there. [9:22] <shiftplusone> and did you figure what the mouse issue was about? [9:26] <ShorTie> Marking fs in need of filesystem check. [9:27] <ShorTie> guess thats all the bad junk, lol. [9:28] <shiftplusone> when you were dd'ing you didn't get any error? And did you sync afterwards. I've seen people claim that dd doesn't not require sync, but I am not 100% sure. [9:31] <shiftplusone> I would dd again, sync, re-insert the card, fsck from the PC and then try again to be safe. Or it might be worth it to just fsck it and see how it goes. [9:34] <ShorTie> does that look right ?? [9:41] <sysx1000> ShorTie: are you root? [10:35] <ShorTie> dd read it fine to, now what just 'sync' ?? [11:18] <ShorTie> what is a 'urb error' ?? [11:20] <ShorTie> can you get dd to ignore the non-partitioned free space ?? [11:33] <ShorTie> so if i shrunk / to 1776 in gparted, a count of like 1780 should work ?? [11:35] <ShorTie> ok, trail-n-error time, lol. [11:37] * ShorTie scratches his head, what cha mean 'shrink the image' ?? [11:39] <shiftplusone> on line 59, I had to remove the "-cu" to make it work though. [11:50] <ShorTie> so that script makes the image too ?? [11:51] <shiftplusone> so you dd the full card to disk, shrink the image using that script, and then you have an image you can transfer to a smaller card. [12:55] <bel3atar> why can't I type anything in the serial console? [12:56] <shiftplusone> connected tx to rx and rx to tx properly? [13:01] <shiftplusone> In any case, it's unlikely to be anything on the pi side. I am very certain it's a connection/adpater problem. [13:04] <pksato> bel3atar: inter connect RX and TX on adapter (not on RPi) and see if have a echo return. [13:05] <sysx1000> getty runs on that port? [13:06] <pksato> bel3atar: on terminal emulator, disabel HW flow control. [13:08] <bel3atar> pksato: how do I do it it minicom? [13:11] <pksato> Test if now have a echo. [13:11] <pksato> good. reconnect to RPi and have fun. [13:14] <pksato> but, have a text from RPi? [13:15] <pksato> It is a 3v3 dongle? [13:15] <pksato> If is a 5V and connected direct to rpi, input can be damanged. [13:17] <pksato> ebay not have info about it is a 3v3 or 5v. 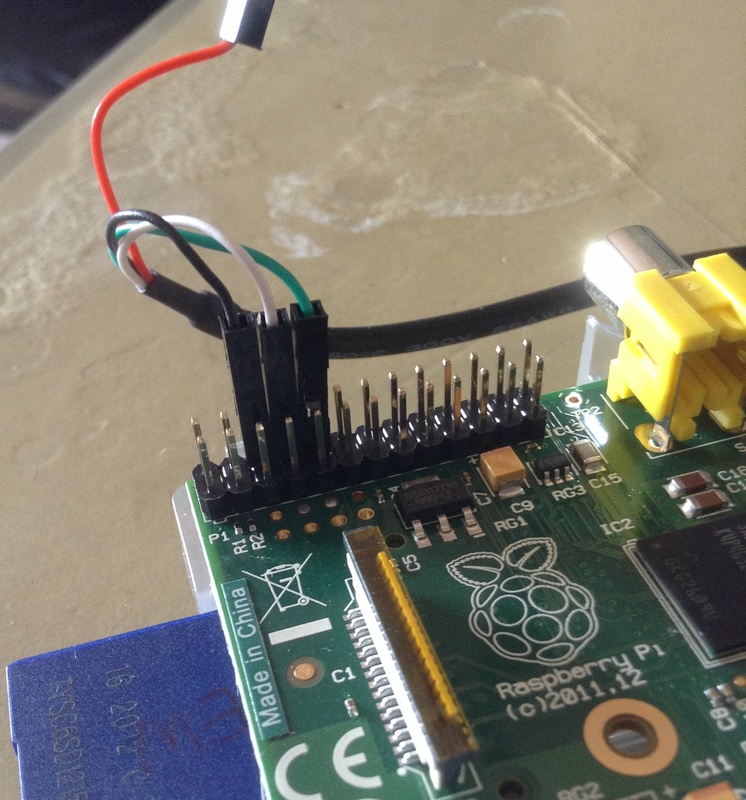 [13:20] <pksato> disable serial console, unload serial module, and test RX as regular GPIO pin for input. [14:36] <IT_Sean> Why don't you paste your question here so people don't have to click on a reddit link to see it, atrioom. [14:38] <pksato> or wait on reddit to some answer. [14:39] <pksato> disable screen blank function on console and X11 server. [14:39] <shiftplusone> Hey, could someone pastebin the foundation's image's etc/wpa_supplicant/wpa_supplicant.conf and /etc/network/interfaces files please? [14:40] <atrioom> pksato: there is something like that? why is it activating? [14:41] <atrioom> pksato: where can I find the setting? [14:41] <pksato> raspiberri pi forum. [14:45] <IT_Sean> Buy a hub. [14:47] <GeekDude> Any recommendations? I'm running off a two amp power supply, so would a powered hub be necessary as well? [14:48] <shiftplusone> GeekDude, once the supply is over 1.2A, it doesn't matter, you still need a hub for high power devices. [14:49] <GeekDude> Hmm. Is there a way I could split the power from the supply to both the hub and the pi? [14:51] <GeekDude> Not to be pushy, but could you throw some links my way? [14:53] <shiftplusone> Nuh, nothing bookmarked. [14:55] <shiftplusone> or butcher up your own splitter from spare cables. [14:58] <IT_Sean> make your own cable. the "splitter" you are looking for will not exist, as it would violate the USB spec. [14:59] <shiftplusone> are you sure the usb hub uses usb for power rather than small dc jack? [15:04] <GeekDude> How might I configure the raspberry pi to autoconnect to wifi when a wifi dongle is plugged in? [15:39] <bel3atar> pksato: I can read input on the port with wiring pi. I guess this means the problem comes from the usb<->serial adapter. [15:48] <pksato> bel3atar: you testing correct pin? or connecting adapter TX to correct RX on pi? [15:50] <pksato> bel3atar: you can made a loop test on rpi too. disable console, install minicom (or not), jumper TX and RX and see if have a echo. [15:52] <pksato> and make sure that using correct pins. [15:59] <pksato> adapter TX to RX on rpi, adapter RX to TX of rpi. [15:59] <pksato> to find TX, use a led+RESISTOr. [16:00] <smeggysmeg> i'm thinking about getting a pi and i'm wondering if my useage scenario is do-able. [16:02] <bel3atar> is anybody having success using a PL2303HX based usb<->serial adapter? [16:03] <Vutral> smeggysmeg, which is ? [16:04] <pksato> bel3atar: if echo test work on PL2303HX and on RPi. have some wrong on you wiring. [16:09] <smeggysmeg> i'm wanting the pi to: be a file server connected to an external drive, hosting home files and multimedia for upnp, smb, ftp; to be an ssh server on my home network. i know it can't be a plex server, but do you think my desktop could be the plex server and access the pi's files via smb? this would only be for streaming when not home. [16:10] <smeggysmeg> i have a shiny new htpc for tv/web/Steam playback, but i would really like to leave my desktop pc turned off and still have access to media. i can WOL my desktop if i wanted its plex functionality in an unplanned circumstance. [16:13] <smeggysmeg> i can do WOL from my router (dd-wrt). would there be a way to WOL my desktop from the pi? [16:39] <smeggysmeg> so it looks like pidora isn't being actively supported, anymore. i'm a regular fedora user now with a history of using redhat/suse - will raspbian have a steep learning curve? [16:47] <biberao> anyone running squeezeplug? [17:12] <IT_Sean> rahul_: generally, no. The LCDs in laptops do not "speak" the same 'video language' as your raspi. [17:12] <IT_Sean> You need a display with a composite or HDMI input. [17:13] <rahul_> IT_Sean: Can't we make use of it? [17:14] <IT_Sean> rahul_: Only if you have another of the SAME make and model laptop that needs an LCD screen. [17:15] <IT_Sean> Basically, no... you cannot use that LCD panel with your raspi. [17:59] <cyclick> How does a rpi compare to a nexus4 for cpu/video benchmark? [18:01] <gordonDrogon> What Ho, good Pi people! [18:03] <SpeedEvil> cyclick: Broadly - a word that cannot be posted in this channel, as it is family friendly. [18:24] <pksato> rahul_: about lcd panel from notebook. Is possible to use, but need to buy a proper display controller ($40 on ebay). [18:26] <geordie> gordonDrogon: yeah that makes sense!? [18:41] <gordonDrogon> Time is an illusion. Lunchtime doubly so. [18:58] <SpeedEvil> I orderd 15kg of pork from ASDA - they billed me for 3kg, and delivered all 15. [19:06] <geordie> anyone have a reccomendation for a cli ftp client? [19:31] <AbbyTheRat> I know the pi is shutdown when 2 of the left goes, right? [19:34] <gordonDrogon> the ACT light actually blinks 10 times, but at the first blink it's shut down. [19:37] <azeirah> Does anybody in here know how to connect this http://cgi.ebay.com/ws/eBayISAPI.dll?ViewItem&item=301075696467&ssPageName=ADME:L:OU:US:1120 screen to a raspberry pi? [19:40] <IT_Sean> Does that screen have composite or HDMI inputs? [19:41] <gordonDrogon> It's SPI. wow. [19:47] <azeirah> So does anybody have an idea what I can do with that screen? [19:51] <gordonDrogon> azeirah, you *need* to know... sure - so why not contact the person you bought it from and ask them. [19:53] <gordonDrogon> Personally, I'd not buy anything unless I knew what I was buying - I'd not touch that with a bargepole unless they were offering drivers, etc. [19:53] <gordonDrogon> You will need kernel drivers/modules to use it as a display device with the Pi. [19:53] <gordonDrogon> It *may* be compatible with the Adafruit one, but they don't mention that. [19:53] <gordonDrogon> I'd look for one with composite video or hdmi if all you want is a display for the Pi. [19:54] <gordonDrogon> with this one you will have to load kernel modules, you might even have to recompile the kernel or get a special kernel to use it. That's great if you're up to it. [19:55] <gordonDrogon> That ones doesn't have a Pi GPIO connector on it. [19:56] <azeirah> There's this other ebay page, which offers a screen which looks *exactly* the same, pin config (heck, the whole message body) is the same too. [20:03] <gordonDrogon> or you could just buy something from a reputable dealier that you know will work. [20:04] <gordonDrogon> no "would be" about that, as it's already awesome. [20:07] <gordonDrogon> it might be. [20:08] <pksato> asked seller about documentation of this lcd? [20:31] <IT_Sean> now, you need to get data to it. [21:55] <[SLB]> i get this output http://pastebin.com/Gz1aarQY i assume it's alright then? [22:08] <ib1s> noob here, can anyone explain why it's necessary to dd the sd card rather than just copying the files on? [22:51] <linguini> Wordpress on my pi was quite slow, but today I setup octopress, and it works nicely. [22:53] <rikkib> Wordpress has to be the most exploitable software on the planet. [22:56] <Squarepy> linguini, so is octopress php? [22:56] <linguini> Squarepy: octopress is powered by jekyll, which is ruby, I believe. It generates static sites. [22:58] <rikkib> For over a year I harvested all their data and passed it on to Vint Cerf for the google security team and others. [22:59] <rikkib> I hacked the s/w they loaded and join the zombie bot net. [23:01] <Squarepy> so are you the bennett guy? [23:03] <Squarepy> so how did you backtrack this one? [23:06] <Squarepy> so a port and an ip f.i. [23:08] <rikkib> A local journo picked up the story when I posted his details on Usenet. [23:10] <rikkib> I used to taint them via email and wind them up. [23:10] <Squarepy> "Well, it wasn�t me, mate. We have closed all that down years ago." [23:11] <Squarepy> that's early 2000? [23:17] <rikkib> In the late 90's spammers attacked my server and knocked NZ off the air for a short time. [23:19] <johnc-> anybody knowledgeable about bluetooth on rpi/linux? [23:22] <rikkib> I run up a blue tooth dongle from guides on the net a couple of weeks ago.... Seemed fairly straight forward. [23:24] <rikkib> It is a one step behind game now days... I use sendmail and spamhuas sbl... I don't see any spam now days. [23:25] <rikkib> not great bandwidth but all that is mine is mine. [23:30] <Gadgetoid> But audio is already wireless? [23:32] <blockh34d> is nRF24 a general serial data transfer over RF device? [23:34] <rikkib> does 32 bytes in a hit. [23:37] <blockh34d> any idea anything that would mess that up? [23:37] <rikkib> flush and close? [23:38] <blockh34d> maybe theres a way? [23:41] <blockh34d> but curses is giving me spit! [23:41] <rikkib> I use c mostly. [23:47] <blockh34d> maybe you'd like to try my app out, give you some ideas? [23:50] <blockh34d> 3.1 when pip installs 2.4! [23:54] <johnc-> so you're sending key presses to omxplayer?